In our community, we take seriously Jesus’s call to love. So we include everyone. That’s why it’s one of our core values that no matter who you are, you are welcome here. We seek to create a place for all to grow and flourish. And we make sure to include those who have typically been excluded. Because God’s welcome is bigger than the barriers we can construct around who’s in and who’s out. So we include everyone. At Central, we are committed to the flourishing of our community. That’s why we strive to help our community grow. Be that through hosting Scouts or the Quilting Club, putting on massive Rummage Sales or the free community meals, we do what we can. Because God calls us to join with our communities to help meet the needs of God’s children. "After Sunday Worship service I feel renewed and uplifted, ready to begin a new week." 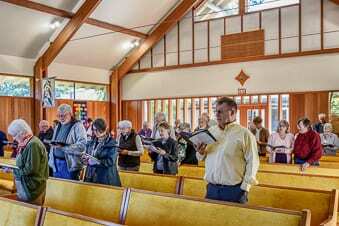 "If you're looking for an inviting and affirming church that has friendly people, good traditional music, and encouraging, thought-provoking messages without feeling preached at nor condemned, then Central United Methodist Church in Sedro-Woolley is for you." "We believe God loves all of his children and we accept everyone regardless of their race, economic status, sexual orientation, or mental ability." "I have always felt very comfortable and welcomed here." "We are very involved in community programs from Scouts, to Community Kitchen, to Pub Theology, to community parades and festivals, to using our facility to assist the community. We're inclusive to all in our doors." "Jesus was and is all about welcoming, embracing, healing, and loving everyone without preconditions. I am continually inspired and motivated by being part of this fellowship that strives to put these values into practice." "We are a gathering of caring people motivated by our faith to provide, as much as we can, practical assistance to people in need. We have a long history of doing this in the local area." "We believe that our Christianity is shown in how we live our lives and how we treat other people, rather than just a statement of faith." "I attend CUMC as I am comfortable, safe, secure and enjoy the membership, community involvement, friendships, and service participation opportunities."